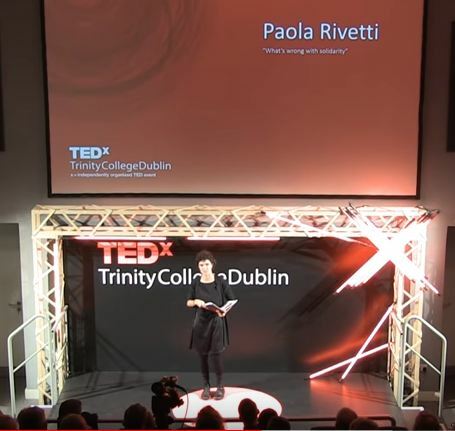 Dr Paola Rivetti, IICRR scholar, delivered a TEDx talk “What’s wrong with solidarity?” The event was organised by TEDxTrinityCollegeDublin. Dr Rivetti’s talk addresses the fear of making mistakes that holds us back, both as researchers and as people. Drawing on her personal experiences she speaks about the journey to seeing mistakes as opportunities and the freedom of conducting research without the fear of making mistakes. Dr Rivetti taps into her experiences working with refugees in Plaza City Hotel in Athens to discuss the pressing issues of how we may lend a hand to those who most need it, while enabling them to maintain their dignity? She discusses how embracing mistakes helped to develop as both a researcher and as a person.